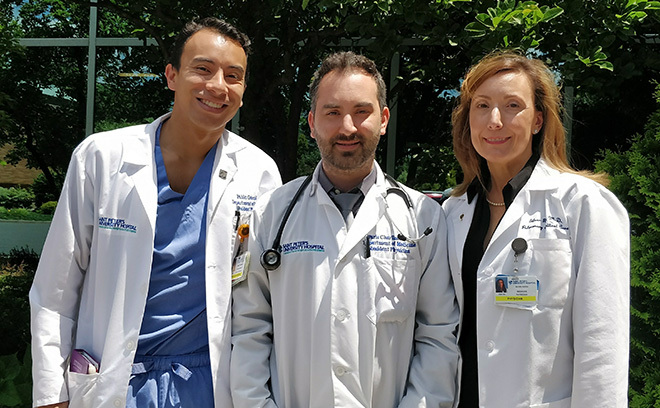 Dr. Paris Charilaou, one of the Internal Medicine PGY-2 residents at St. Peter’s University Hospital, demonstrated compassion and commitment to patient care. A 42-year-old patient was admitted to the medical intensive care unit with acute liver failure due to alcoholic hepatitis. His acute liver failure progressed during his early hospital stay, and it was determined that he needed emergent transfer to a liver transplant center. While we were rounding, we called Dr. Charilaou, who had recently finished an elective rotation at the nearest liver transplant center. Dr. Charilaou made dozens of phone calls to residents, fellows, and attendings at that institution that he had met during his elective. He stayed after hours to coordinate the transfer and in less than 6 hours the patient was transferred to the transplant center for further management and care. The residency program and the team caring for this patient are so proud to have such an individual in our institution. Not only does Dr. Charilaou have terrific clinical skills and knowledge, but also clearly demonstrated his willingness to go above and beyond his duties to get our patients the care they need. He is compassionate, thoughtful, and always committed to patient care. Do you know a resident who has gone beyond the call of duty to save a patient? Share your story and see it featured on NEJM Resident 360.